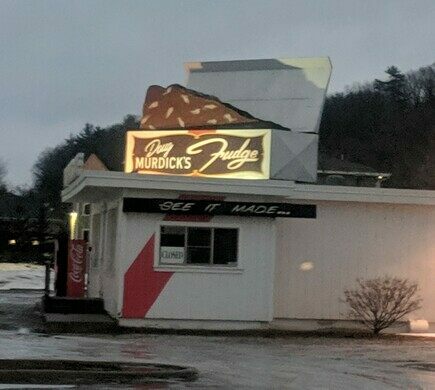 Doug Murdick’s Fudge opened its first store in downtown Traverse City in 1964. In 1965, they opened a second location along U.S. 31 in nearby Acme Township. 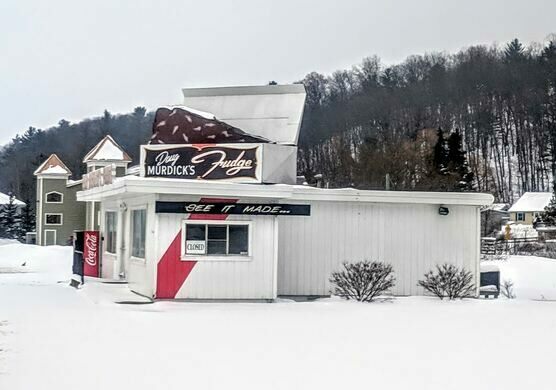 The newer spot quickly distinguished itself with an iconic decoration: a giant box of fudge on its roof. 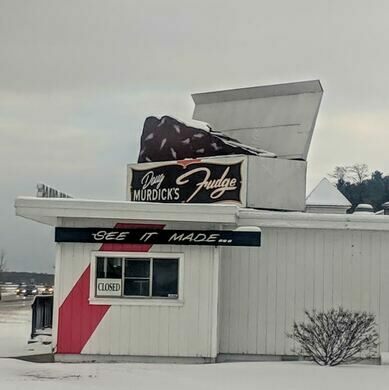 Given the number of fudge shops dotting many towns in Northern Michigan and their immense popularity with the tourists, those vacationing “up North,” especially the ones who frequent multiple fudge shops, are often referred to as “fudgies” by local residents. The fudge shop is located on the east side of U.S. 31. During the winter months, the parking lot may not be plowed. This tree was warped centuries ago to serve as a botanical wayfaring tool.